Can you believe that Easter is almost here? For the past couple of years it’s been in late April which made me feel like there was no time at all between Easter and Memorial Day so this is quite the pleasant change. I like when there are more than a few weeks between my holidays. I feel like I can better prepare for them when I’m not bouncing from holiday to holiday! 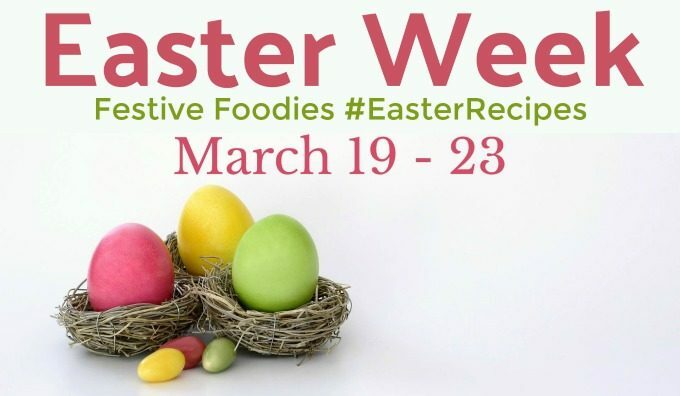 The Festive Foodies have created an event for this week, aptly called Easter Week where we all share Easter inspired recipes with you. It’s being hosted by Christie of A Kitchen Hoor’s Adventures. We’re sharing recipes today, Wednesday and Friday so make sure you check in each day to see what I’ve created. Links to the recipes by other bloggers for this event can be found at the bottom of the page. I’m leaving for a girl’s trip to Vegas on Easter Day so we’re celebrating it the day before. But because I’m going on vacation, I know that it would just not be possible to prepare for vacation and cook an entire Easter meal. So, like last year, because I decided to host one week after we moved into the house, I’m taking advantage of the prepared Easter dinner I can pick up and warm up from the local farm place. I will make an appetizer and a dessert, as I did last time, but there won’t be any Easter side dishes or main dishes made in my kitchen this year. 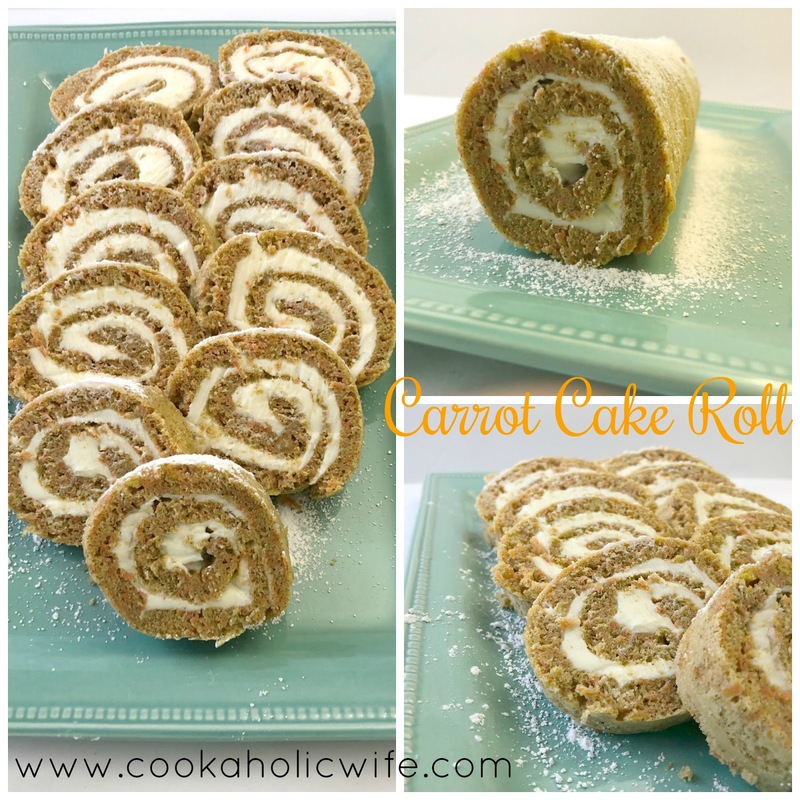 Would you believe I’ve never had carrot cake until I made this recipe? 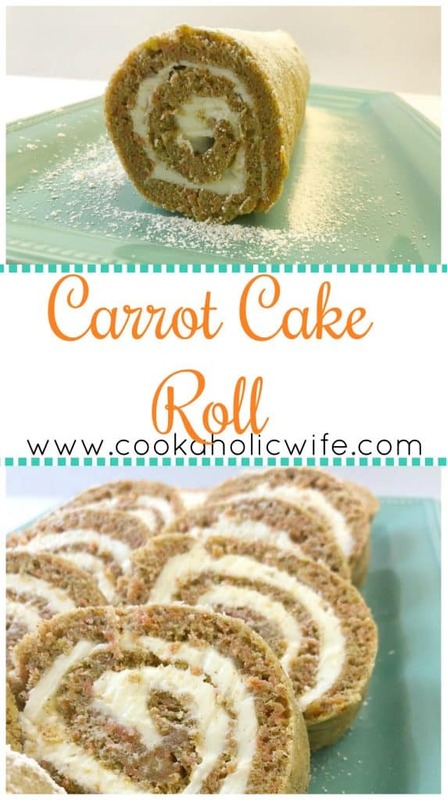 I’ve never been a huge fan of cake and it always seemed rather strange to my previously picky taste buds to make a cake with a vegetable, even though I love carrots and know that they’re on the sweeter side. 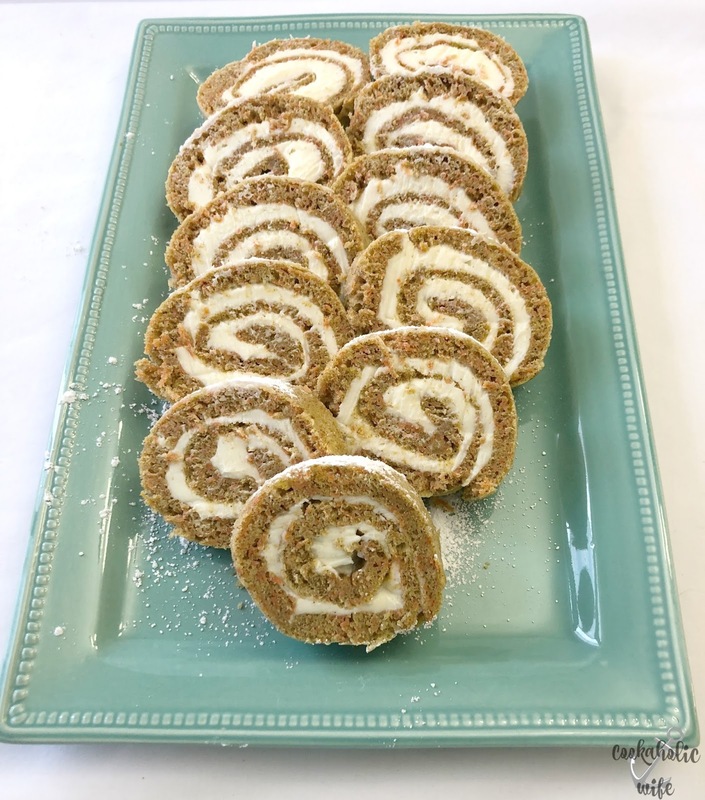 Don’t be intimidated by a roll cake; this Carrot Roll Cake is easy to prepare and perfectly sweet with a cream cheese filling. Preheat the oven to 375 degrees. Spray a jelly roll pan with cooking spray and place parchment on top. In the bowl of a stand mixer, beat the eggs on medium speed until frothy and dark, about 5 minutes. Then add in the sugar, applesauce and vanilla extract. In a medium bowl, whisk together the flour, baking powder, cinnamon, ground ginger, ground nutmeg and salt. Add the grated carrots and flour mixture to the mixer and mix until just combined. Pour the batter onto the prepared jelly roll pan. Use a spatula to spread the mixture into an even layer as it will be just enough to cover the entire pan. Bake for 10-13 minutes or until the cake springs back when pressed with your finger. Remove from the oven. Lift the parchment and cake off the pan and place on a heat-safe surface. Starting with the short end, roll up the cake and parchment together into a log. Place on a wire rack to cool completely. While you wait, prepare the filling. Add the cream cheese, butter, powdered sugar, vanilla extract and salt to the bowl of your stand mixer and beat with the paddle attachment until light and smooth. Once the cake has cooled, carefully unroll it and spread the cream cheese mixture all over the cake. 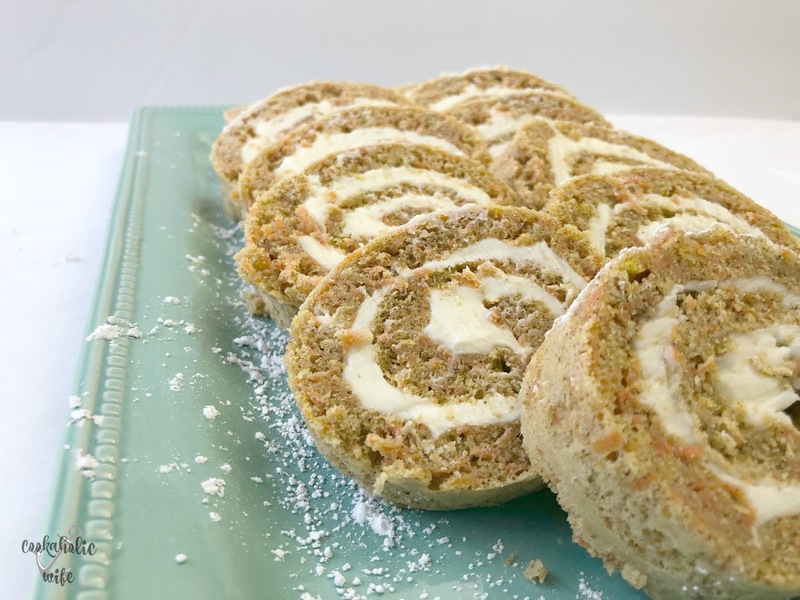 Roll the cake back up again, gently peeling off the parchment paper as you go. Wrap the cake in plastic wrap and refrigerate for one hour. Slice a sliver off each end to remove the excess cake that may not have rolled up correctly. Transfer to a plate and dust with powdered sugar before slicing. Make sure to fully cover your parchment paper with cooking spray. You can also spray a bit of cooking spray on the sheet pan before placing the parchment on top, so it doesn’t move around when you’re pouring the batter on top. Use a silicone or other flexible spatula to spread the batter onto the parchment. You want it to be very even. 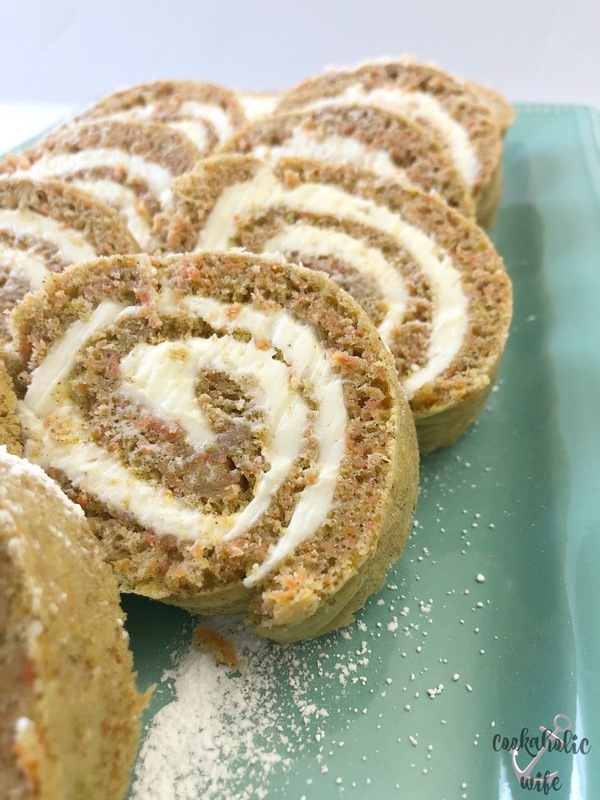 The tighter you first roll the cake, the more round of a shape it will have. If your cake breaks, you can patch the inside with frosting. For the outside, you can add additional frosting to cover it or sprinkle extra powdered sugar on top if it’s a tiny tear. For presentation purposes, slice off either end of the cake so you only serve the rounder, fuller pieces. 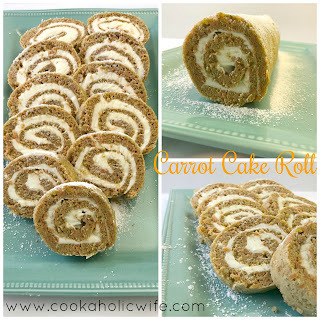 Honestly, this was the easiest roll cake I’ve ever made. I’m not sure if it’s because I was super busy and multi-tasking that I didn’t allow the anxiety of the cake falling apart to even cross my mind, or what, but I’m surely not going to complain. 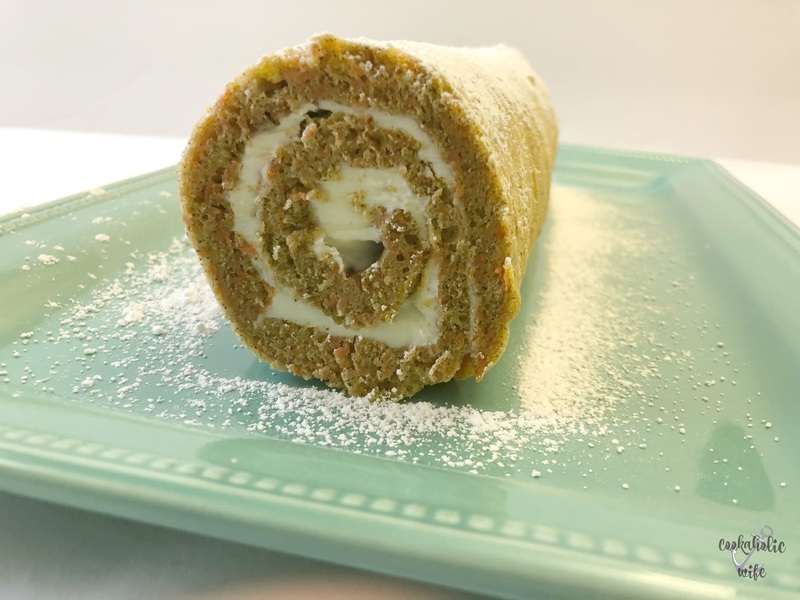 The cinnamon, ginger and nutmeg add a nice warmth to the carrots mild flavor and well, you can never go wrong with cream cheese frosting in my book! That is a beautiful cake Nichole. Have fun in Vegas!! I love your suggestions for a patch job: more cream cheese and a powdered sugar cover up!! I would definitely need those tips. 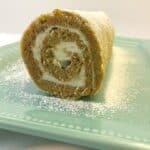 One of these days I will attempt a cake roll, especially with your great tips!